The EB-MDC2 is a Bluetooth Class 2 USB adapter which complies with new Bluetooth V2.1+EDR standards and is backward compatible with Bluetooth V2.0, V1.1 and V1.0. Bluetooth V2.1 provides many useful functions, including lower power consumption and enhanced security. With the EDR( Enhanced Data Rate) technology, it provides the data rate up to 3Mbps. Class 2 device maintains Bluetooth connections up to 10. 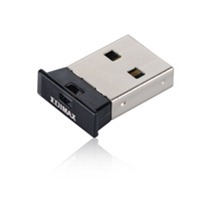 The EB-MDC2 compact design allows you to fit it in a limited space without interfering with other USB devices.